An uplifting aroma of sandalwood, cinnamon and patchouli. This type of incense is known as a masala which means spice. This is because the incense is made from a complex blend of natural fragrant oils, forest herbs and spices. This results in a soft incense that always remains moist, for this reason it's very slow burning. Each incense stick will burn for an hour. An uplifting aroma of sandalwood, cinnamon and patchouli. This incense is just 1 from an extraordinary collection of 14 fragrances, probably the most unique incenses you will come across. This type of incense is known as a masala which means spice. This is because the incense is made from a complex blend of natural fragrant oils, forest herbs and spices. This results in a soft incense that always remains moist, for this reason it's very slow burning. Each incense stick will burn for an hour and the fragrance will linger for days. 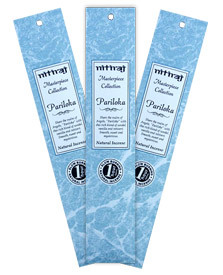 This incense is commonly used to set the mood for meditation, yoga and relaxation. Each packet contain 10 grams approximately 10 sticks.